Here we have another amazing development from game designers, Playcon. 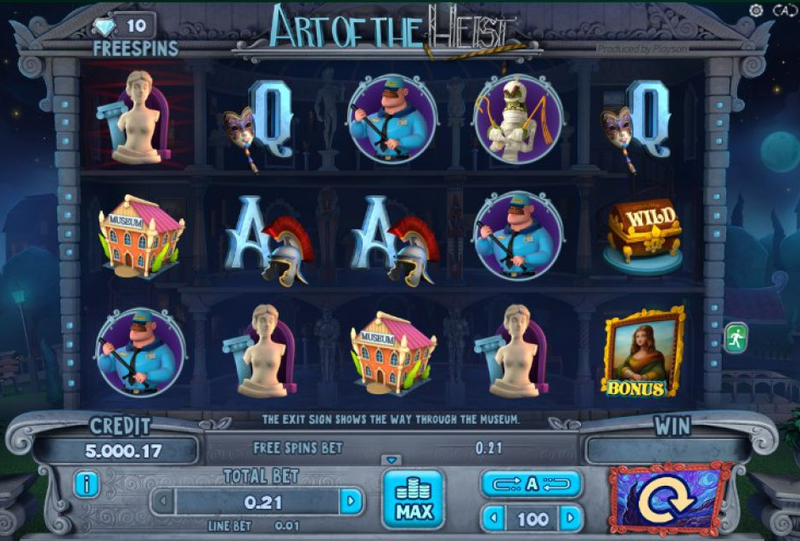 Art of the Heist is a beautifully designed 5 reel online casino slot game that centres around one burglar’s escapades robbing an art gallery. Watch as you spin the reels and witness the robber searching each room behind your symbols. Spin and deposit today to earn your fortune. 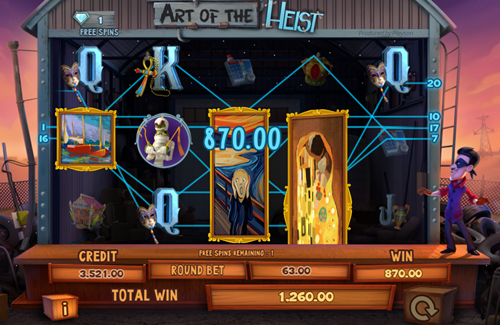 Art of the Heist is the Mona Lisa of online slot games. Playson is a leading gaming developer based in Malta, with a large portfolio covering both online and land-based machines. You can discover more about Playson's games here. Priding themselves on their HD graphics and state of the art technologies Playson have produced iconic titles such as Fireworks Master and Down the Pub – each with its own range of play methods and bonus features, this keeps the gaming landscape fresh and allows players to rediscover their love for gaming with each thrilling instalment. Opening with a cinematic cut scene players will automatically feel immersed in the storyline, follow a group of thieves as they break their way into a museum filled with priceless artefacts. Having to dodge danger almost immediately, weird things start happening around them. As mummies take to the halls the scene is set for the Art of the Heist. Within the 5 reel, 21 pay-line museums, players will find a range of objects including classically designed poker symbols accompanied by various pieces, along with the undead mummies, crowns, museum security and even a decoder. The decoder can be one of the most valuable items in the museum as they could be the key to your escape. At the beginning of the game, the thief is trapped in the top left square, when a decoder lands in the laser-filled square the thief has the chance to deactivate the square and move closer to his escape. If when the thief moves forward he lands on a square with a Security officer he will be cuffed to the column for 3 turns, if he lands with a Mummy he will run backwards 2 spaces, losing a fair amount of escape progress. To access the bonus room, filled with priceless antique players much land the bonus portrait on the reels – you will then be taken to a new screen to help the thief navigate the back room. During this mini-game, a certain number of keys will be set to find a discharge switch and land huge cash prizes. When players return to the base game their main priority will be to continue the escape of the museum if the player does manage to walk out unscathed a Free Spin round will be launched, chock full of expanding wilds and big payout opportunities. 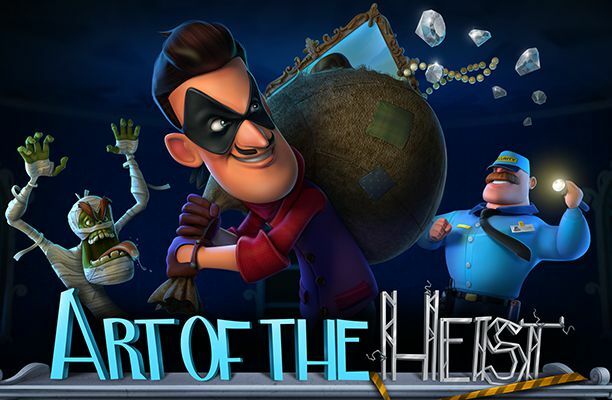 Art of the Heist has one of the most immersive storylines in video slot history, it gave me flashbacks to childhood board games with the progression and range of story points. Taking sides with a villain for a change is also a refreshing difference, it seems to fit the nature of the genre well as in this scenario it would be the thief who walks away with a large cash payout rather than an additional protagonist. Despite all the new features, this game is still easy to follow as it also holds a mix of more traditional bonuses, features such as wilds and scatters ensure seasoned gamers can still find their footing amongst the comical storyline.